Armed with curiosity and a camera, road-tripping couple Sarah and Greg explore trust, fear, and American culture by relying on the kindness of strangers for a home each night. This is a charming and interesting film about 2 young filmmakers’ journey across the USA and interactions with a wide variety of strangers. It is an enjoyable time especially for those that might like “reality shows.” In addition to the interactions with strangers, there are many great scenes of landscape across the USA and the music is a good fit too. 3.0 out of 5 starsLefty kids if the USA will put them if in their home. They find out the USA is not that bad. One you need to know the two kids that make this film are super left. But I think that they learn a lessen that most people on the right are not bad people. I could with a little less whining from the young lady in film. I don't understand why they could not get one single AA home put them up or put it in the film. It is fun to watch. I think They could have done a better job if they would have been friends and not love birds. This is a moving, often funny, very inspiring film about kindness and compassion in America. The people who take in Sarah and Greg are so real - so honest - I especially loved Jolene, the Cheyenne grandmother in Montana who opens up about her community's persecution, yet also shares so much love with Sarah and Greg. It's also a blast to see the country, so many amazing landscapes! Made me feel great pride about this country - but also great criticism. I was lucky to see this movie during the American Bear screening tour, where Sarah and Greg did a Q&A. I was glad to hear them talk about their identities and their privilege - both white, heterosexual, young, college students - and how their experience depended on that. Not everyone would have had the "luck" that they had - or maybe it would have just been different people who would have hosted. Seeing the Q&A especially made the movie so thought-provoking - I was thinking about for many days afterward, and questioning how I interact with people I don't know... It made me want to be more open-hearted, open-minded, and really give my positive energy to anyone I encounter. This is the filmmakers' first big movie, and it's definitely a little rough around the edges, but I thought that was part of its charm, you just feel like you're right there with these young adults, learning about the world through their eyes. Plus, the music is a great set of folk tunes that just keep the road trip rolling along. Definitely check this out (and support indie filmmakers)! This is an authentic, unscripted story about fascinating individuals living in different corners of modern America. Each person the filmmakers feature is living a life that is so specifically American, but also so different from the others. Yet even with all these intriguing characters, I am most interested in Sarah and Greg. They are smart, critical, creative and brave, yet feel so ordinary, in a really beautiful way. I saw this film when it came to my college and the filmmakers, Sarah and Greg really wanted to have a serious conversation with us about all of the complications in their project. The film itself is full of amazing stories, but there are so many more to tell! You can tell its their first feature though, part of it even explores how young they were when they made it; but there is something really neat about the way the camera work gets better as the film goes along. It's almost like a visual representation of what they are learning. About America, Americans, but definitely also about themselves. 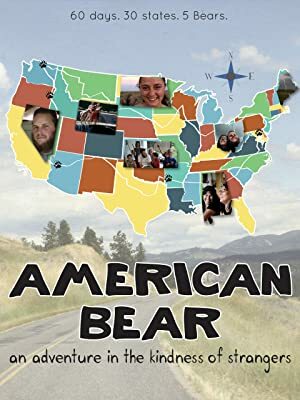 I just saw American Bear with a friend and really loved it. It's making me reflect on the many wonderful people there are in the world and how my personal experience supports their results. I loved how honest and upfront they were with each other and with the people they met. I was afraid it would go on too long, but the editing was good and kept me interested. It just makes me happy that these young people and so many others are finding ways to connect and remind us all of our humanity. It was an antidote to all the negative things we hear about daily that make it seem like things are falling apart. 5.0 out of 5 starsAmerican Bear Fan! This documentary is an adventurous love story that explores the willingness of real people to trust and engage with strangers. Entertaining, provocative and feeling, this film will touch you and leave you thinking about it in your everyday interactions long after you have watched the movie. We meet two film students who discover and deepen their love for one another over the course of an ambitious project. At the same time they encounter and introduce us, the audience, to a wide variety of wonderful people; the rich tapestry that makes up the bedrock of America. These people open up their homes to two strangers and then share their unique stories with all of us. We are better for the experience; reaffirming our faith in the human condition and leaving us feeling inspired as if we were in the living rooms and sharing time with new families and friends across the country. Start with two young people who have a great deal of faith in human kindness and watch them set out on a trip across the country inviting strangers to prove them right. Their adventure wasn't without ups and downs and a few tense situations. In a world where we are conditioned to assume the worst about people, I found myself wondering how I would react if approached by strangers like these two. It left me smiling, wanting to be a better person, and itching for a road trip of my own. 5.0 out of 5 starsA great film to wath as a family or on date night, or just because. This movie is heart warming and hopeful but clearly a first feature from Sarah and Greg. I love that the filmmaking gets better as the film progresses! I was so touched by the reactions of perfect strangers to the couples request to stay in their homes. A truly real film that opens up discussion on the heartland of Americas viewpoints on many issues. The cinematography was very good given the reality setting and lack of a chance to get a second take. I think it was a brave and well needed documentary that explores the average Joe (or Josephine) feelings. Looking forward to more from the team.